National Space Centre atteded the two-day Skolkovo Roadshow in London on 14 & 15 February 2012, where a delegation of senior executives from the Skolkovo Foundation were in London to showcase opportunities for universities, institutes and businesses to gain funding from Skolkovo through joint research/commercial projects in key areas, including Space & Communications. Sergey Zhukov, Executive Director, Space & Communication Cluster at Skolkovo, visited National Space Centre’s Elfordstown base en route to the London Roadshow. 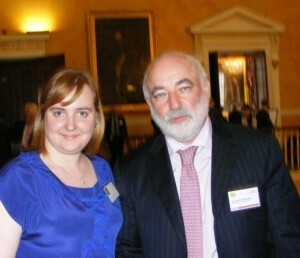 Pictured (l-r) Marina Sologub, National Space Centre, Sales & Marketing – Russian Markets who presented Skolkovo Foundation President, Viktor Vekselberg with a bottle of Jameson Irish Whiskey.